Mississippi provides counsel to indigent youth through a county- or circuit-based system that is mostly locally funded. In some counties, youth are represented by court-appointed attorneys selected from a list of recommendations by the county or regional bar association. In counties or judicial circuits where the board of supervisors determines there are enough indigent defendants to support the establishment of a public defender office, youth are represented by a public defender. Miss. Code Ann. § 25-32-1 The circuit judge appoints a practicing attorney to serve as a public defender and the expenses are paid by the county or counties that establish the office. Miss. Code Ann. §§ 25-32-3(1), 25-32-7. 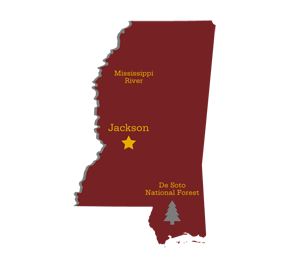 Mississippi has an Office of State Public Defender which has three divisions, the Capital Defense Counsel Division, the Indigent Appeals Division, and the Training Division. Miss. Code Ann. § 99-18-1. The Appeals division has staff attorneys and uses attorneys on a contract basis, whereby all fees must be approved by the court. Miss. Code Ann. § 99-40-1(2). The Training Division is responsible for training all of the state’s public defenders. Miss. Code Ann. § 99-40-1(4). An Indigent Appeals Fund was created in the State Treasury to provide funding for the Indigent Appeal Division. Miss. Code Ann. § 99-40-1(3). Attorneys appointed to represent delinquent youth in Mississippi must complete an annual juvenile justice training that is approved by the Office of State Public Defender or the Mississippi Commission on Continuing Legal Education. Miss. Code Ann. 43-21-201(3). Mississippi has no required juvenile defender standards. In addition to statutes and case law, juvenile court proceedings are governed by court rules. These are often promulgated at the state level, but may also be passed at the local court level instead of or in addition to statewide rules. Mississippi juvenile court rules are called the Uniform Rules of Youth Court Practice. In Mississippi, youth in juvenile court have the right to “counsel at all critical stages: detention, adjudicatory and disposition hearings; parole or probation revocation proceedings; and post-disposition matters.” Miss. Code Ann.§ 43-21-201(1). In addition, “If indigent, the child shall have the right to have counsel appointed for him by the youth court.” Miss. Code Ann. § 43-21-201(1). Appointed counsel must also represent youth on appeal, unless granted leave of the court. Miss. Code Ann. § 43-21-201(5). A youth court judge shall inform a youth of their rights, including the right to counsel, when the youth first appears before the court. Miss. Code Ann. § 43-21-201(2). If a child is not represented at adjudication and either wants to retain counsel or is eligible for court-appointed counsel, the court “shall continue the hearing for a reasonable time to allow” the child to consult with counsel. Miss. Code Ann. § 43-21-557(2). If a child is taken into custody, he or she must be informed of their rights during custody, including the right to counsel. Miss. Code Ann. § 43-21-311(1)(c). If a detained child is represented by counsel, “no person may interview or interrogate the child concerning the violation of a state or federal law, or municipal or county ordinance by the child unless in the presence of his counsel … or with their consent.” Miss. Code Ann. § 43-21-311(4). Mississippi has no presumption of indigence in juvenile court proceedings. When the judge is satisfied that the defendant is indigent and unable to employ counsel, the judge may appoint an attorney. Miss. Code Ann. § 99-15-15. Every defendant is given the opportunity to sign an affidavit of indigence affirming their inability to hire a lawyer. Miss. Code Ann. § 25-32-9(1). The indigent person shall list all assets, employment status, dependents, income, and the ability of parents or spouse to pay. Miss. Code Ann. § 25-32-9(1). If the court appoints counsel and later determines the defendant is not indigent, representation will be terminated. Miss. Code Ann. § 25-32-9(1). The court may order a youth’s parents to pay for the cost of counsel if the parents are financially able. Miss. Code Ann. § 43-21-619(1). Mississippi does not have a specific statute, rule, or case law addressing a youth’s waiver of counsel. The statutes that specifically address children’s right to counsel do not suggest that they may waive their right to counsel (“the child shall be represented by counsel at all critical stages” and, “If indigent, the child shall have the right to have counsel appointed for him.”). Miss. Code Ann. § 43-21-201(1), U.R.Y.C.P. 14(a). However, the general statute regarding appointment of counsel—which includes any person charged with an act of delinquency—does discuss waiver (“[T]he public defender shall represent said person unless the right to counsel be waived by such person.”) Miss. Code Ann. § 25-32-9. When and how the court may decide to detain a child or otherwise place restrictions on the child’s freedom is defined by statute and court rules. In Mississippi, a detention hearing must occur within 48 hours of the child being detained, excluding weekends and state holidays. Miss. Code Ann. § 43-21-307. Other provisions regarding the detention of youth can be found in Miss. Code Ann. §§ 43-21-301, 43-21-303, 43-21-309, 43-21-311, and 43-21-313, and U.R.Y.C.P. 11, 12, 16, 17, 18, and 19. The legal needs of youth in the delinquency system rarely end at disposition, and states vary in the way they provide a right to representation on these post-disposition issues. Mississippi statutes list three post-disposition proceedings at which youth have a right to counsel. Miss. Code Ann. § 43-21-201(5). A youth who is on military active duty or is married is not considered a “child” or “youth” in juvenile court. Miss. Code Ann. § 43-21-105(d). Discretionary Waiver: Juvenile court may transfer for youth 13 and older to circuit court for any offense, after motion by any party and a hearing. Miss. Code Ann. § 43-21-157(1). Statutory Exclusion: Circuit court has original jurisdiction over any felonies that would be punishable by life imprisonment or death if committed by an adult under state or federal law. Miss. Code Ann. § 43-21-151(1)(a). Statutory Exclusion: Circuit court has original jurisdiction over some felonies involving the use of a deadly weapon. Miss. Code Ann. § 43-21-151(1)(b). Once an Adult, Always an Adult: The circuit court retains jurisdiction over any child who has been convicted previously in circuit court. Miss. Code Ann. § 43-21-157(8). The Mississippi Assessment was completed in 2007.